One of the best things that technology has brought to the world of skiing is the use of ski cams. Going skiing is an exciting way to spend a vacation, but it can be challenging and expensive to plan a good trip. Ski cam footage can help ensure that your chosen location has exactly what you are looking for in a resort. The following websites are excellent resources for finding and viewing ski cameras from ski resorts around the world. If there is a particular slope that you want to find, try searching for it by name at one of these sites. Odds are, if they have a website, they will have a ski cam. Once you choose a specific area, you will be presented with a variety of resorts to choose from. These resorts will have camera footage on their websites for you to view. All cams are clear and give great images of the specific location selected. Once you select a state or Canadian province, you will be shown a page of web cam thumbnails. The thumbnails are small so you will need to select the one that is of interest to you and view it in a larger size to see the best detail. You will also be given the current weather conditions and links to more web cams. Vail Ski Resort in Colorado has ski cams that let you see the current conditions on areas such as Eagle's Nest, Clock Tower, Covered Bridge and Wildwood. Stowe Mountain Resort in Vermont offers skiers some great images from their web cams. There are two cameras that allow visitors to see the resort as well as the mountains. Crystal Mountain Resort in Washington has web cams that show the Gold Hills in real time. The footage gives a clear view of the mountain and its conditions. Many ski mountains and resorts today have cameras installed at various locations on their property. The feeds from these cameras are routed to the resorts' Internet sites, and you can drop by and take a virtual peek at exactly what is happening on those mountains at that moment. Think of them as more altruistic, less creepy security cameras. Snow conditions: You will be able to tell if the slopes look icy and hard or if there is fresh powder. Congestion: Get an idea of how busy the resort is on a particular day. You can check out the lift lines and the number of skiers going down the slopes. Layout of the mountain: Get a sense of how the mountain is laid out. 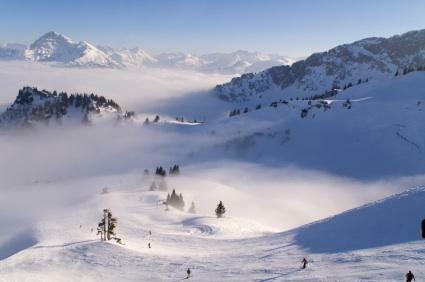 You can get a feel of what it is like to ski down a specific area and assess the skill level required for various runs. All the maps, snow reports and weather conditions are no match for a simple picture. By visiting the ski cams of the mountains you are thinking of visiting, you will get a much more complete feel for what it's like when you step onto those slopes and clip into your bindings.